Boron nitride (BN) coatings were prepared using BCl3-NH3-H2-N2 precursor system by chemical vapor deposition process in a vertically-placed hot wall reactor. The effect of processing parameters on the deposition rates was analyzed. The morphology and microstructure of the BN coating on the surface of the silicon carbide fiber were characterized by scanning electron microscope (SEM), X-ray photoelectron spectroscope (XPS) and X-ray diffraction (XRD) . The dominant gas-surface reactions and crucial gas-phase components during BN deposition process were established. The results show that the deposition rates of BN increase gradually with the elevating deposition temperature from 600℃ to 850℃. 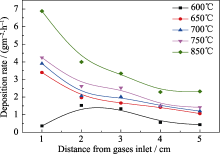 And at a defined temperature, the deposition rates of BN gradually decrease along the gases flow direction in the deposition area, indicating that the gas-phase components are gradually consumed along the gases flow direction. 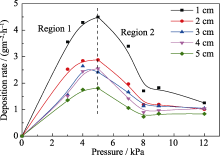 The deposition rates of BN increase firstly and then decrease with the increase of system pressures, which suggests that the deposition process change from surface reactions control to mass transfer control. 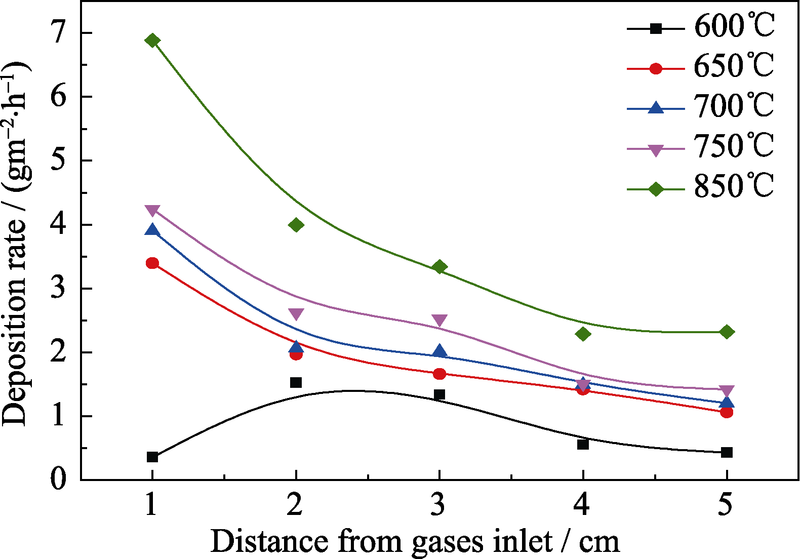 The BN deposition rates increase at 1-3 cm away from gases inlet, but decrease after increase firstly at 4-5 cm away from gases inlet as the residence time getting longer. SEM results show that BN coating on the surface of silicon carbide fiber is relatively smooth and dense. The chemical compositions of coating determined by XPS are BN and B2O3. XRD results indicate that the deposited BN at 650℃is amorphous. After heat-treatment at 1200℃ for 2 h, it transformed into the hexagonal BN(h-BN). The deposition of BN is achieved by the intermediate gas-phase species composed of Cl2BNH2, ClB(NH2)2 and B(NH2)3 which were generated by the reaction of BCl3 and NH3. 王梦千, 贾林涛, 李爱军, 彭雨晴, 张方舟. BCl3-NH3-H2-N2前驱体化学气相沉积法制备氮化硼涂层[J]. 无机材料学报, 2018, 33(11): 1179-1185. Meng-Qian WANG, Lin-Tao JIA, Ai-Jun LI, Yu-Qing PENG, Fang-Zhou ZHANG. Preparation of Boron Nitride Coating from BCl3-NH3-H2-N2 Precursor by Chemical Vapor Deposition[J]. Journal of Inorganic Materials, 2018, 33(11): 1179-1185. 在650℃、7 kPa、0.5 s、nBCl3 : nNH3 : nH2 : nN2=1 : 3 : 1 : 6条件下, SiC纤维表面沉积BN涂层不同放大倍数的SEM照片"
在650℃、7 kPa、0.5 s、nBCl3 : nNH3 : nH2 : nN2=1 : 3 : 1 : 6条件下, 沉积BN涂层的XPS图谱"
在650℃、7 kPa、0.5 s、nBCl3 : nNH3 : nH2 : nN2=1 : 3 : 1 : 6条件下, SiC纤维表面沉积BN涂层的XRD图谱"
 XU L, BAI S, WU J F, et al.Pyrolytic Boron Nitride. Proceedings of the 8th National Symposium on New Carbon Materials. 2007: 91-100. SONG GUI-HONG, DU HAO, HE CHUN-LIN.Hard and Superhard Coating. Beijing: Chemical Industry Press. 2007: 167-171. PEASE R S.An X-ray study of boron nitride.Acta Crystallographica, 1952, 5(3): 356-361. LI R, ZHANG C R, LI B, et al.Research progress and prospect of boron nitride materials.Bulletin of the Chinese Ceramic Society, 2010, 29(5): 1072-1078. DU S, LI F, GAO L Q.The preparation of BN by chemical vapor deposition.Electron Compon, Mater. 1995, 14(1): 8-13. ROGER R NASLAIN, PAILLER J F, LAMON J L.Single- and multi-layered interphases in SiC/SiC composites exposed to severe environmental conditions: an overview.International Journal of Applied Ceramic Technology, 2010, 7(3): 263-275. LI J S, ZHANG C R, LI B.Research progress of boron nitride interface in ceramic matrix composites.Material Review, 2011, 25(9): 14-21. 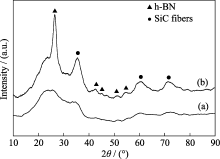 ZHOU Y, ZHOU W C, LUO F, et al.Research progress of BN interface in SiCf/SiC composites.Material Review, 2013, 27(7): 10-14. JACQUES S, VINCENT H, VINCENT C, et al . Multilayered BN coatings processed by a continuous LPCVD treatment onto Hi-Nicalon fibers.Journal of Solid State Chemistry, 2001, 162(2): 358-363. 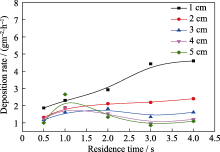 ZHANG L T, CHENG L F.Preparation and Application of Self-healing Ceramic Matrix Composites. Beijing: Chemical Industry Press. 2015: 131-132. LEE W Y, LACKEY W J, AGRAWAL P K.Kinetic analysis of chemical vapor deposition of boron nitride. Journal of the American Ceramic Society, 1991, 74(10): 2642-2648. CHOLET V, VANDENBULCKE L.Chemical vapor infiltration of boron nitride interphase in ceramic fiber preforms: discussion of some aspects of the fundamentals of the isothermal chemical vapor infiltration process. Journal of the American Ceramic Society, 1993, 76(11): 2846-2858. PATIBANDLA N.Chemical vapor deposition of boron nitride.Journal of the Electrochemical Society, 1992, 139(12): 3558-3565. MATSUDA T, NAKAE H, IRAI T.Density and deposition rate of chemical-vapor-deposited boron nitride.Journal of Materials Science, 1988, 23(2): 509-514. BLOCHER J M.Structure/property/process relationships in chemical vapor deposition CVD.Journal of Vacuum Science & Technology, 1974, 11(4): 680-686. LI J S, ZHANG C R, LI B.Preparation and characterization of boron nitride coatings on carbon fibers from borazine by chemical vapor deposition.Applied Surface Science, 2011, 257(17): 7752-7757. GUIMON C, GONBEAU D, PFISTER-GUILLOUZO G, et al.XPS study of BN thin films deposited by CVD on SiC plane substrates.Surface & Interface Analysis, 1990, 16(1-12): 440-445. ALKOY S, TOY C,GÖNÜL T, et al. Crystallization behavior and characterization of turbostratic boron nitride. Journal of the European Ceramic Society, 1997, 17(12): 1415-1422. CHOI J Y, KANG S J L, FUKUNAGA O, et al. 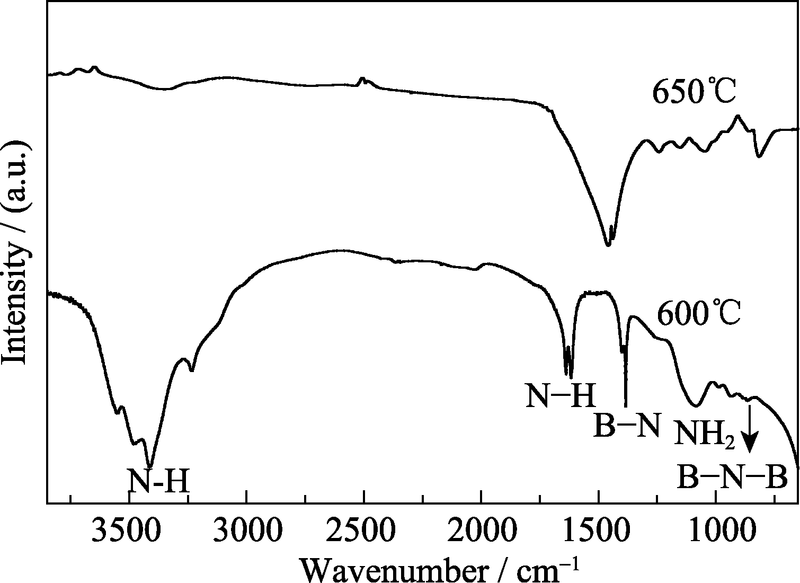 Effect of B2O3 and HBN crystallinity on CBN synthesis.Journal of the American Ceramic Society, 2010, 76(10): 2525-2528. GALLET S L, CHOLLON G, REBILLAT F, et al.Microstructural and microtextural investigations of boron nitride deposited from BCl3-NH3-H2, gas mixtures.Journal of the European Ceramic Society, 2004, 24(1): 33-44. ALLENDORF M D, MELIUS C F, OSTERHELD T H.A model of the gas-phase chemistry of boron nitride CVD from BCl3 and NH3.Materials Research Society, 1996, 410: 459-464. ANTHONY M D, ALLENDORF M D.Flow-tube investigation of the high-temperature reaction between BCl3 and NH3.Journal of Physical Chemistry A, 1998, 102(40): 7804-7812. 耿仁杰, 俄松峰, 李朝威, 李涛涛, 吴隽, 姚亚刚. 高结晶度氮化硼纳米片的制备及其与聚乙烯醇复合薄膜的性能[J]. 无机材料学报, 2019, 34(4): 401-406. 严世胜, 彭鸿雁, 赵志斌, 潘孟美, 羊大立, 阿金华, 叶国林, 王崇太, 郭心玮. 掺氮金刚石电极性能及其氧化降解硝基苯研究[J]. 无机材料学报, 2018, 33(5): 565-569. 穆阳, 邓佳欣, 李皓, 周万城. 两种连续SiC纤维的高温介电及吸波性能对比[J]. 无机材料学报, 2018, 33(4): 427-433. 李家科, 韩效奇, 刘欣, 王艳香, 郭平春, 杨志胜. 低温分相法制备高比表面积微/介孔SiOC陶瓷[J]. 无机材料学报, 2018, 33(12): 1360-1364. 高姣姣, 姜龙凯, 宋金鹏, 梁国星, 安晶, 谢俊彩, 曹磊, 吕明. TiC含量对WC-TiC-TaC硬质合金材料微观组织及力学性能的影响[J]. 无机材料学报, 2017, 32(8): 891-896. 孙丹丹, 张家良, 武燕庆, 张仲秋, 刘大康. 原料预处理对BaTiO3压电陶瓷的物性影响[J]. 无机材料学报, 2017, 32(6): 615-620. 张昌松, 刘强, 陈威. hBN含量对Si3N4-hBN复相陶瓷性能和微观结构的影响[J]. 无机材料学报, 2017, 32(5): 509-516. 韩霜霜, 刘莉月, 单永奎, 杨帆, 李德增. 石墨烯/纳米减反结构复合透明导电薄膜的研究[J]. 无机材料学报, 2017, 32(2): 197-202. 余艺平, 王松, 李伟. DCP法W/ZrC金属陶瓷的激光烧蚀行为研究[J]. 无机材料学报, 2017, 32(12): 1332-1336. 乔振杰, 高乐, 冯倩, 胡建宝, 董绍明, 马良来. 硼含量对碳硼化合物结构、力学影响行为研究[J]. 无机材料学报, 2017, 32(11): 1228-1232. 龚伟, 李华, 周黎明, 白朝中, 王恩泽. 3Y-TZP/LZAS微晶玻璃功能梯度涂层的微观结构与性能[J]. 无机材料学报, 2017, 32(1): 63-68. 付朝丽, 杨勇, 马云峰, 魏玉全, 焦正, 黄政仁. 离子源偏压对PIA-EB-Hf法制备的HfO2激光薄膜性能的影响[J]. 无机材料学报, 2017, 32(1): 69-74. 孙庆磊, 周洪庆, 钱磊, 王亚洲, 朱海奎, 岳振星. MgO/SrO/La2O3多元添加对(Zr0.8Sn0.2)TiO4微波陶瓷结构性能影响[J]. 无机材料学报, 2016, 31(8): 812-818. 武燕庆, 张家良, 刘大康, 孙丹丹. Ba(Ti0.96Sn0.04)O3陶瓷的物性研究[J]. 无机材料学报, 2016, 31(8): 850-854. 杨超, 李莹, 闫璐, 曹韫真. 原子层沉积工艺制备催化薄膜厚度对生长碳纳米管阵列的影响[J]. 无机材料学报, 2016, 31(7): 681-686. 范武刚,高濂. 二甲基亚砜介质中纳米Mn3O4的合成[J]. 无机材料学报, 2006, 21(4): 789 -792 . 樊传刚,刘卫,左艳波,邓增强,黄祥贤,陈初升. SrCo0.8Fe0.2O3-δ及SrCo0.8Fe0.1Sn0.1O3-δ的热学性能与透氧性能研究[J]. 无机材料学报, 2006, 21(5): 1141 -1146 . 王敬平,梅炳初,周卫兵,王 苹,杨淑霞. 新型层状化合物Ti2AlC在酸性溶液中的腐蚀行为[J]. 无机材料学报, 2009, 24(2): 402 -406 . 戴春雷,杨金龙,黄勇. 凝胶注模成型延迟固化研究[J]. 无机材料学报, 2005, 20(1): 83 -89 . 王艳香,谭寿洪,江东亮. 反应烧结碳化硅的研究与进展[J]. 无机材料学报, 2004, 19(3): 456 -462 . 姚志强,杨萍,孙鸿,王进,冷永祥,陈俊英,黄楠. 阴极真空弧源沉积氟化类金刚石薄膜的结构与性能研究[J]. 无机材料学报, 2005, 20(3): 727 -734 . 张琳琳,许钫钫,冯景伟,阮美玲. 石墨化对碳纳米管结构与电学性能的影响[J]. 无机材料学报, 2009, 24(3): 535 -538 . 茂功,钟顺和. 聚酰亚胺/TiO2 复合膜的制备、表征和气体渗透性测定[J]. 无机材料学报, 2007, 22(1): 148 -152 . 王国庆,吴顺华,赵玉双,张志萍. 两相复合介质内部电场及宏观介电常数的三维模拟[J]. 无机材料学报, 2004, 19(1): 214 -222 . 王为,贾法龙,黄庆华,张伟玲,郭鹤桐,申玉田. 电化学组装一维纳米线阵列p型Bi2Te3温差电材料[J]. 无机材料学报, 2004, 19(3): 517 -522 .